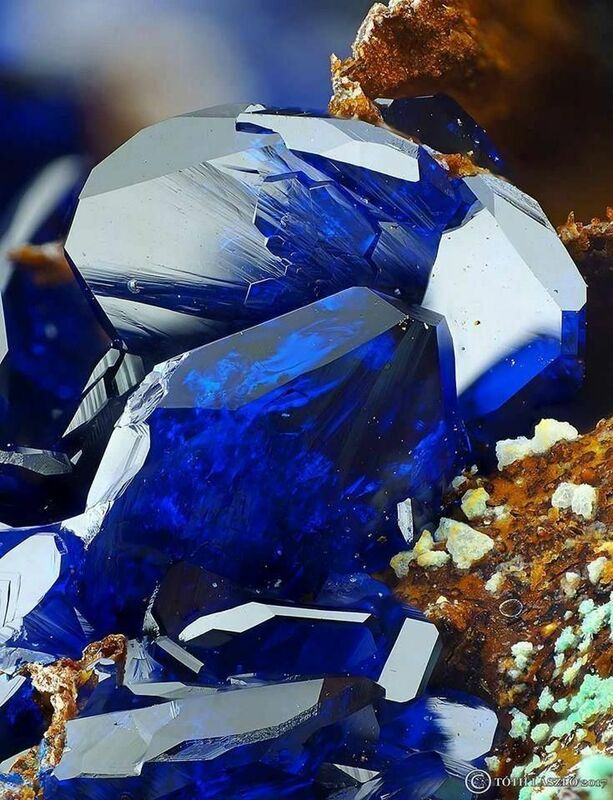 No crystal embodies the pure Blue Ray quite like Azurite. The rich vibrancy of its dark-blue energy resonates to the exact frequency of the Third-Eye Chakra, and has been guiding souls to enlightenment since the earliest civilizations began. To the inhabitants of Atlantis and the early Egyptians, Azurite was a most potent psychic stone and shrouded in mystery; its secrets known only to the highest priests and priestesses. It was called the Stone of Heaven by the ancient Chinese who believed it to open celestial gateways, and was revered by Greeks and Romans for its visionary insights and healing powers. For the Mayans, Azurite inspired the mystical self and facilitated the transfer of wisdom and knowledge via thought, while Native Americans used this sacred stone to contact their spiritual Indian guide, feel the presence and understand the message. For modern practitioners, Azurite’s metaphysical properties still mirror its legacy powers, clearing away tension and confusion, and opening the mind to new perspectives. This crystal stimulates the intellect, awakening the development of psychic and intuitive abilities, and brings inner vision into alignment with spiritual guidance. It may be used for the enhancement of dreams, entering a meditative or channeling state, and enables out of body journeys to take place safely. 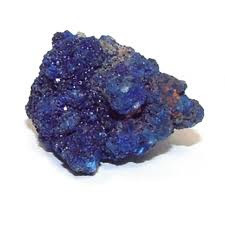 Azurite is beneficial in exploring past or alternate lives, and its ability to clear the Throat Chakra allows for precise verbalization recalled from these experiences. Azurite is a soft stone, named for its deep “azure blue” color. It is a copper carbonate mineral found in the upper oxidized portions of copper ore formed in masses, nodules, tabular or prismatic crystals, sometimes with a vitreous luster. The saturated color ranges from bright to deep blue into shades of indigo, and may contain streaks of light blue. It has been ground into pigment for paint and used as a dye for fabric for thousands of years. Azurite is often found in nature mixed with Malachite, another copper carbonate mineral, this one with a bright green color. Together, in polished form, they resemble Mother Earth and carry not only their individual properties, but a powerful blend of healing energies. Azurite-Malachite is an exceptional conductor of energy, bringing a grounded, more integrated process in healing physical dis-ease. The blue ray penetrates and moves energy, calming stress levels within the system while the green ray facilitates a deep healing force. It may also be used to activate the Third Eye in cleansing the subconscious of emotionally charged thoughts or negative feelings, and restoring a higher and clearer mental state. It assists in dissolving egocentric traits, dispelling conceit, arrogance and vanity, and instills a willingness toward flexibility and individuality based on a universal connection to “All.” Azurite-Malachite’s combination of energies is highly conducive to meditation by allowing one to go deep within the self, without fear, in order to be sustained, absolved, and reborn into the light, completely aware of the genesis at all times. Azurite tempers the mind; it releases stress and confusion, and alleviates worry, indecision, and thoughts that linger in the back of the consciousness. To restore balance and control over emotions and reactions, simply hold the crystal and ask to have the troublesome thoughts evaporate. It is a rubbing stone that prefers to be touched to release its energies, so when wearing or carrying Azurite, remember to rub it often. 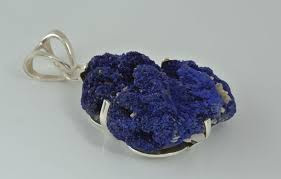 Azurite is a stone for connecting with sacred powers through religious music, such as Gregorian or Buddhist chants, choral music and hymns; also for healing with sound, especially using the drums, didgeridoo, pipes or the voice. The energy of Azurite is highly effective for use as a pendulum and in radionic analysis. It assists psychics, mediums, channels, or other Light workers in improving the accuracy of their interpretations and helping to maintain objectivity. Azurite stimulates all the mind centers, nourishing a keen interest in life, one’s function in society, and discovering new commonalities and links within our world. It encourages the study of new and challenging subjects, not only for school or college students, but for adults trying to fit study in with other commitments, and for “students of life” over-fifty or in retirement. 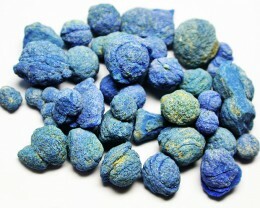 Azurite enhances focus and concentration, memorization and retention of information. An excellent crystal for examinations, interviews, presentations, or negotiations, Azurite also fortifies long-term career plans, especially in large or very structured organizations. It is particularly beneficial for careers in all governmental departments, museums, libraries and universities. Azurite is a good crystal for older people who live alone or in sheltered accommodations to maintain their independence, mental alertness and physical health. Azurite aids circulation and oxygenating the blood, and works at a cellular level to restore any blockage or damage to the brain. This is a good stone for Alzheimer’s, dementia and other degenerative brain-related disorders, as well as aging. 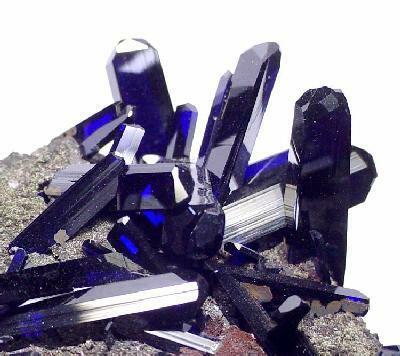 Azurite may also soothe migraines, lessen tinnitus, and balance vertigo. It is also reported to improve reflex actions. Azurite cleanses and strengthens the emotional body, releasing stress and worry, and overcoming grief and sadness. It brings a healing light into consciousness allowing it to be infused into thoughts, feelings, words and action. It also reveals fears and phobias for what they are and provides an understanding of why they occurred in the first place. Azurite lends the courage to overcome negative patterns of behavior stemming from insecurity and fear. It helps those who are deceptive or lie habitually to be more clear and truthful to themselves and to others. It calms those who talk too much out of nervousness, and encourages those who hold back from self-expression to verbalize their thoughts and feelings. 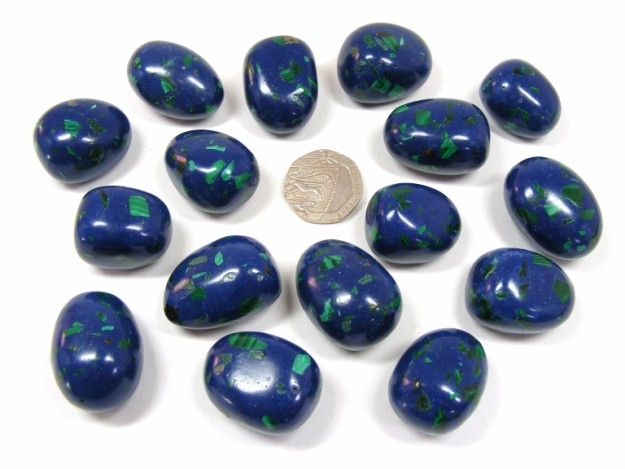 Azurite is excellent for overcoming an inferiority complex, living only to please others, and in overcoming domestic bullying by one’s children, partner, parents, or friends who always know best. Azurite lessens tensions between different generations when sharing a home, especially when there are three or more generations, or relations involved in step-parenting. Azurite’s deep blue energy stimulates the Third Eye Chakra in awakening the psychic and intuitive self, and in opening the mind to spiritual guidance. It provides insight into all areas of our lives. It aligns the chakras and attunes the physical body to the ethereal, dissolving blockages throughout the system. The unimpaired flow of energy allows for increased communication and verbalization through the Throat Chakra. The Throat Chakra is the voice of the body and is, in essence, a pressure valve that allows energy from the other chakras to be expressed. If it is blocked, or out of balance, it can affect the health of the other chakras. When the Throat Chakra is in balance and open, it allows for the expression of what we think and what we feel. We can communicate our ideas, beliefs, and emotions, bringing our personal truth out into the world. We have an easy flow of energy within the body and spirit. The energy that springs upward from the lower chakras can continue its path enabling free expression and natural release. Blue crystal energy unblocks and balances the Throat Chakra. Darker shades of blue encourage the power of truth, while lighter shades carry the power of flexibility, relaxation, and balance. Azurite inspires the search for truth in one’s personal reality by challenging the examination and letting go of old programmed belief systems, and expanding one’s awareness to a deeper understanding of life. Azurite’s vibrant blue energy has the ability to move subconscious thought into the conscious mind to be reviewed and tested for truth, a search that reveals one’s true motives in spiritual connection and whether they are for the highest good of all beings and not for personal gain or ego fulfillment. Azurite also allows one to sense the truth in what others would have us believe and protects one from being misled. efforts on service to others. Azurite in shades of Indigo combines the intuition of the violet ray with the trust of the pure blue ray. It brings wisdom, truth, dignity and spiritual mastery. A stone of judgment and long life, it promotes introspection and can result in profound wisdom when used well. Dark indigo crystals provide honesty and are especially good for religious and spiritual journeys, while light indigo crystals connect us to the natural world and improve our appreciation of others. Azurite is highly conducive for meditation and relaxation, allowing one to easily enter the void of the “no-mind” state. It lets one travel deep within the inner being, and to maintain the depth for spiritual guidance or to explore past or alternate lives in order to recover information and knowledge from those lifetimes. 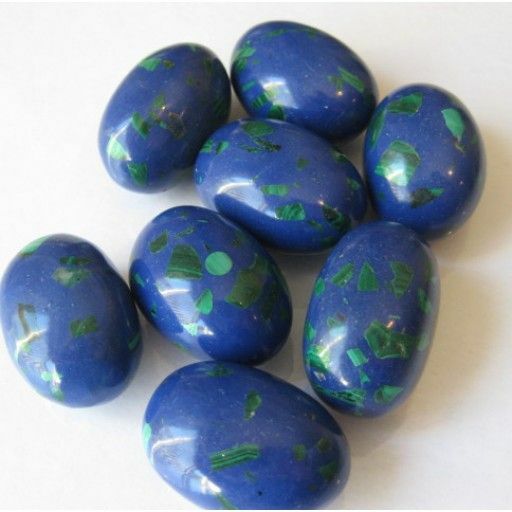 Azurite-Malachite in its natural state is an excellent meditative aid to connect with Mother Earth. Simply hold a crystal in each hand and sit quietly on the ground for a few minutes to provide an awareness and appreciation of the earth as a living organism upon which we are totally dependent. Robert Simmons & Naisha Ahsian, The Book of Stones (Berkley, CA: North Atlantic Books, 2007). Cassandra Eason, The New Crystal Bible (London: Carlton Books Ltd., 2010). William T. Fernie, The Occult and Curative Powers of Precious Stones (Blauvelt, NY: Rudolph Steiner Publications, 1973). Michael Gienger, Healing Crystals (Scotland: Earthdancer Books, 2009). Judy Hall, The Crystal Bible (Cincinnati, OH: Walking Stick Press, 2003). Judy Hall, The Crystal Bible 2 (Cincinnati, OH: Walking Stick Press, 2009). George Frederick Kunz, The Curious Lore of Precious Stones (New York: Dover Publications, 1971). Dorothee L. Mella, Stone Power II (Albuquerque, NM: Brotherhood of Life, Inc., 1986). Robert Simmons & Naisha Ahsian, The Book of Stones (Berkley, CA: North Atlantic Books,2007).